Hello. I'm Amrith Ramkumar, here to get you set for the day's trading. Futures are edging up after stocks extended their winning streak following minutes from the Fed's last meeting yesterday. We'll get a number of economic data points including manufacturing PMI figures and existing-home sales later this morning. Investors are also weighing earnings from Bunge and Hormel Foods, with Kraft Heinz and Caesars scheduled for the afternoon. 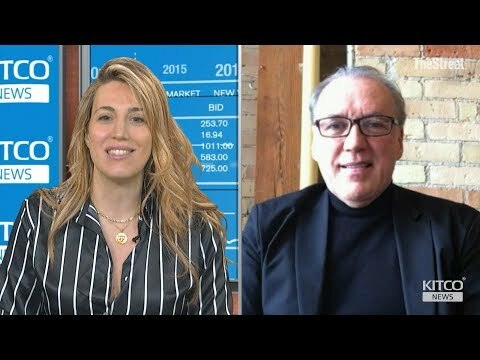 Plus, our Ira Iosebashvili breaks down the latest leg higher for gold prices. Global stocks paused after a recent run of gains, a day after minutes from the Federal Reserve’s meeting signaled uncertainty about the strength of the economy. Investors are buying gold again, as concerns about a slowing global economy put a premium on safer investments. 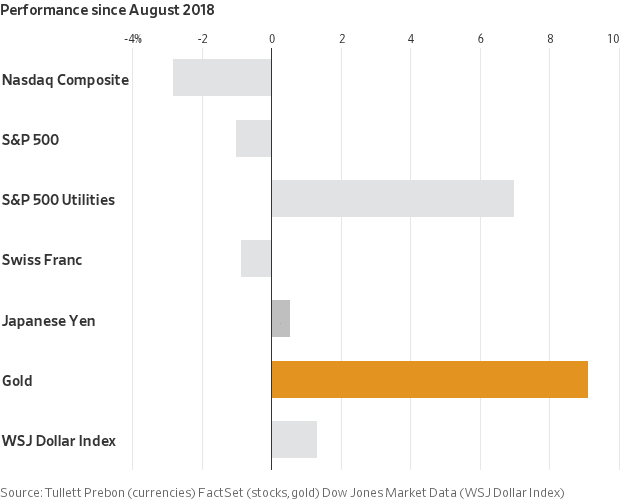 Gold prices are up 14% since late August, when the Nasdaq Composite last hit a fresh record, and stand at their highest level since last April. Gold-focused exchange-traded funds notched nearly 72 tons of inflows last month, exceeding their total for all of 2018, according to the World Gold Council. Fresh worries about the health of major economies in Europe have quelled the expected rise in global interest rates this year, boosting the stock of negative-yielding government bonds. Gold draws more investor interest when borrowing costs fall, in part because lower rates reduce the disadvantages of holding a nonyield-bearing asset and because the lower rates are a function of economic uncertainty. That's made gold a compelling choice for money managers seeking to hedge their portfolios at a time of anxiety over economic growth and trade conflicts, said George Gero, managing director at RBC Capital Markets. "Everywhere they look, investors see problems," Mr. Gero said. A stock-market decline late last year has also helped gold, though this year’s gold rally has taken place alongside a sharp bounce in the S&P 500, which is up 11%. “After the complacency of recent years, investors are realizing they may be overexposed on the equity side and want to build up a hedge,” said Maxwell Gold, director of investment strategy at Aberdeen Standard Investments. Investors aren’t the only ones seeking out gold. Central banks bought the most gold by volume last year since 1967, according to the World Gold Council. Gold holdings at global central banks have increased by roughly 13%—or 3,900 tons—since 2009, according to TD Securities. China announced in December that it had increased its gold pile by nearly 10 tons in 2018, its first purchases in three years. Also buying last year: Russia, Turkey and Kazakhstan. Many emerging-market countries are looking to boost their gold reserves, which are comparatively small, said Bart Melek, head of commodities strategy at TD Securities. Other nations, such as Russia, which has been sanctioned repeatedly by the U.S. in recent years, are seeking to lessen their dependence on the dollar. Mr. Melek expects central-bank gold holdings to grow by another 800 tons over the next two years. Front-month U.S. crude oil rose 1.5% Wednesday, putting it at its highest level since Nov. 12 and up 25% for the year. That rally in the first 34 trading days of the year is oil's best start to a year on record, according to a Dow Jones Market Data analysis of figures going back to 1984. Still, prices are 26% below their Oct. 3 multiyear highs. The Cboe Volatility Index, or VIX, fell 5.8% Wednesday to 14.02, its lowest settle since Oct. 4 and third consecutive decline. Wall Street's fear gauge, which measures expected swings in the S&P 500, has tumbled 45% this year as markets have recovered. On this day in 1947, Edwin Land, founder of Polaroid, demonstrated the instant camera to 650 scientists assembled at the annual meeting of the Optical Society of America. Never before had it been possible to develop a snapshot within a single minute. The Land Instant Camera sold at an initial price of $89.75. Although Polaroid lost money on it at first, it went on to make the company one of the great growth stocks of postwar America. The Atlanta Fed’s Raphael Bostic speaks on the economy and monetary policy at 7:50 a.m. ET. U.S. jobless claims, scheduled for 8:30 a.m., are expected to fall to 227,000 from 239,000 a week earlier. The Philadelphia Fed's manufacturing survey for February is expected to fall to 14 from 17 a month earlier. It is also slated for 8:30 a.m.
U.S. durable goods orders for December are expected to rise 1.5% from a month earlier. They will be released at 8:30 a.m.
Markit's U.S. manufacturing purchasing managers index for February, out at 9:45 a.m., is expected to tick down to 54.2 from 54.9. U.S. existing-home sales for January are expected to rise to an annual rate of 5.02 million from 4.99 million a month earlier. The figures are scheduled for 10 a.m. The Conference Board's leading economic index for January, slated for 10 a.m., is expected to rise 0.1%. Natural-gas stockpiles for the week ended Feb. 15 are slated for 10:30 a.m. Inventories are expected to have fallen 165 billion cubic feet, slightly more than average for this time of year, per the average forecast of 11 analysts and traders surveyed by the Journal. Crude-oil inventories are scheduled for 11 a.m. Stockpiles are projected to have climbed 2.6 million barrels last week, according to 11 analysts surveyed by the Journal. 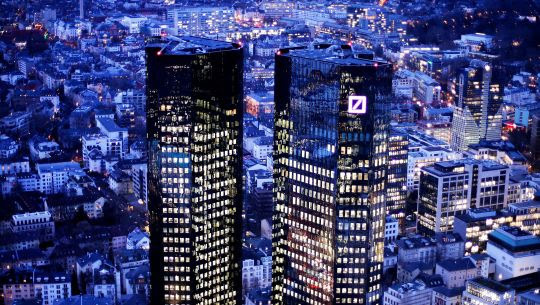 Deutsche Bank lost $1.6 billion on a bond bet. One of the banking industry’s biggest soured bets since the financial crisis involved a complex municipal-bond investment. Warren Buffett was enmeshed in the deal. Lowball prices on stock options could be Silicon Valley’s juiciest perk. Employee stock options awarded by companies ahead of an IPO are typically priced around a third cheaper than their market value, a Wall Street Journal analysis found. Lyft plans to list its shares on the Nasdaq. The ride-hailing company is expected to make its IPO filing public as early as next week. The Fed signaled its balance-sheet runoff will end later this year. Most Federal Reserve officials last month indicated they were ready to stop shrinking the central bank’s $4 trillion asset portfolio this year and believed an action plan should be released soon. Barclays countered an activist investor with 2018 profit growth. Barclays sought to fend off an activist investor with plans to buy back shares and a strong message that its current strategy is working. UBS was fined $4.2 billion in a French tax-evasion case. French judges ordered UBS to pay a record $4.2 billion fine for helping wealthy people evade taxes, closing a chapter in the long-running case against the Swiss bank. Apple and Goldman Sachs are teaming up on a credit card paired with the iPhone. The companies hope to lure cardholders by offering them extra features on Apple’s Wallet app, which will let them set spending goals, track their rewards and manage their balances. Agilent Technologies: The company gave projections for the current quarter slightly below consensus analyst targets. Boston Beer: The brewer said it foresees price increases and growth in shipments for 2019. Albemarle: The chemicals company boosted sales across its portfolio in the fourth quarter, topping revenue estimates. Avis: The car-rental company exceeded adjusted earnings expectations and posted sales in line with targets. Foot Locker: The athletic apparel and shoe company raised its quarterly dividend and authorized a new share repurchase plan.